For over 15 years , SIDNEJ has been producing a wide range of preserved fruits and vegetables ,continuing the tradition of Berat , a south - central Albania city , recently included in UNESCO's World Heritage List . The company is located in the heart of Berat"s countryside, a virgin environment without pollution and smog, in a harmonious scenery where the basic ingredients of our preserves are growing among natural scents and colours . All fresh materials are handled with traditional methods , proccesed immediately after collection and Filled using modern machinery , to ensuer authentic and unique quality. To meet the growing needs of the market ,the company has established a brand new facility in order to offer morre products reflecting the Albaninan culinary traditon . Today , SIDNEJ markets a range of 180 products:olives, processed tomatoes ,extra virgin olive oil varieties , preserves and stuffed olives , different products marinade cucumber, pepper, mixed salad, peppers stuffed with cabbage, traditional jams , different compote . 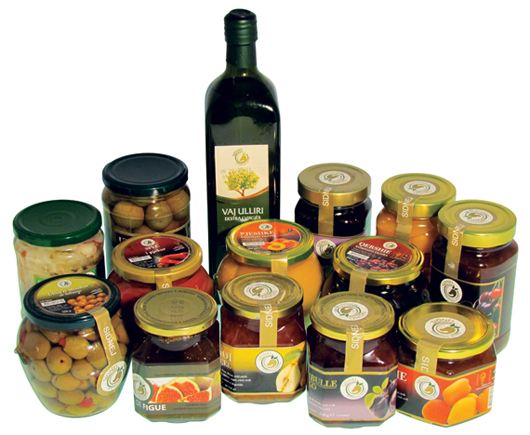 All products are currently distributed to the best gourmet shops and supermarkets throughout Albania, and are also exported to European and countries . Thanks to its highly-skilled staff ,SIDNEJ is in a position to meet all needs of the customers , including more details on how to produce private labels and customized recipes .